Dr. Leslie Goldblatt was always one of those kids who would bring strays home and ask, “Mom, can we keep him?” For as long as she can remember, Dr. Goldblatt has appreciated the unconditional love pets offer—she knows that pets help make us better human beings, and she’s made nurturing that connection her life’s work! Dr. Goldblatt grew up in St. Louis Park, Minnesota as the oldest of three children. After high school, she earned a Bachelor’s degree in Social Work but wasn’t satisfied with her career options. While looking through a large reference book of careers, Dr. Goldblatt came across the “veterinarian” entry. Immediately, she knew that was what she was destined to do! She took all the required undergraduate courses, applied to veterinary school at the University of Minnesota, and was accepted. 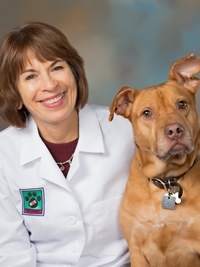 Dr. Goldblatt worked as an Associate Veterinarian at a metro-area practice for the first 13 years of her career. In 1995 she started at Brookview Animal Hospital—which would later become Golden Valley Animal Hospital—and signed on as a co-owner in 1998. Dentistry is one of Dr. Goldblatt’s favorite parts of her job. Sending pets home with clean teeth and fresh breath gives her great satisfaction! She’s also passionate about geriatric medicine and is certified in veterinary acupuncture, which allows her to alleviate pets’ pain and discomfort in a non-invasive way. Dr. Goldblatt has three grown daughters, a son-in-law, and a granddaughter. She lives with her husband Bernie and their gentle rescued dog, Beanie. In her time away from the clinic, Dr. Goldblatt stays active by running regularly, weight training twice a week, and practicing Pilates. She’s also fond of reading and is a certified scuba diver.